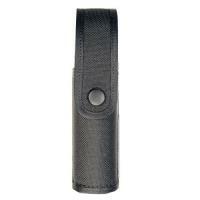 Made of ballistic nylon and heavy duty rivets, this durable covered holder from Stallion Leather offers a streamlined, lightweight, durable, and affordable flashlight case for your duty belt. The American Warrior can fit flashlights like the Streamlight Scorpion, Strion, PolyTac, SureFire 6P and similar compact flashlights up to 5.25" in length. The Stallion tactical holder features a covered flap closure to protect your flashlight and has belt loops to fit 2.25" belts. For trusted performance, choose Stallion to carry your gear! Belt loops to fit belts up to 2.25"